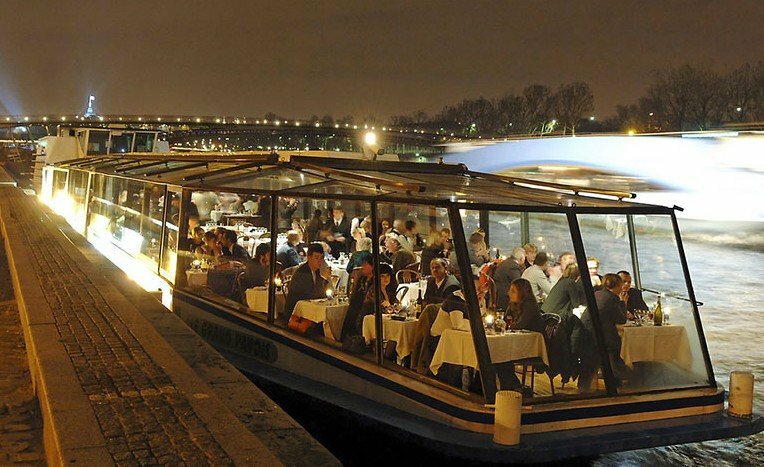 To the rhythm of the river, with the most beautiful sights of Paris passing by, get on board for a historic, romantic and gourmet cruise with one of the boats of the now famous Marina de Paris. The settings are fabulous, be it on board the Grand Pavois, the huge boat with its state of the art technology or on the Vert Galant where subdued comfort has made the reputation of these mythical cruises. On both ships you will enjoy an unforgettable panoramic view overlooking all major monuments of Paris, from Notre Dame to the Eiffel Tower, not forgetting the Louvre, Grand Palais, Place de la Concorde and Invalides. Through the windows, comfortably seated in one of the luxurious reception areas, you will be overwhelmed by the light and beauty of the capital, totally open for you during the 2h30 cruise. The crew is very efficient and professional and here you are certain to turn any event into a pure moment of bliss. Other highlight of French culture, along with its capital of light: its cuisine, taking on its true meaning at Marina de Paris. Traditional and refined, the cuisine will marvellously accompany this dreamlike moment, charming you with its quality. The presentation and taste are of excellent quality, each dish is a tribute to the most prestigious specialties of French cuisine that you will discover in incredible settings. The compositions you are offered at Marina de Paris no doubt match the expectations you will get thanks to the moment enjoyed on board. These cruises are famous throughout the world and they can be put in two simple words: Dream and Magic. You will discover, admire and dream one of the most beautiful cities in the world seen from the water. The trip is gourmet and fairytale like, ideal gourmet can only recommend it.